Anything we buy, be it a bag of crisps, a TV, or a family car, we are drawn to the household names we know and trust because they offer consistency and value for money. This is because such organisations have created a set of standards that guarantee quality and consistency of product and service delivery, irrespective of whenever or wherever these purchases are made. Over the past 50 years, we’ve witnessed much change in purchasing needs. The last decade, however, has seen most of us left with a fraction of the leisure time we once had. As our lives get ever busier, new business models have evolved to meet these demands – supermarkets, for example, now offer a seemingly endless range of products as well as your groceries, meaning you can get pretty much anything all under the one roof – or indeed from the comfort of your own home through their website. How many times have you or someone you know asked the question “Do you know a good Roofer?”, “Do you know of a good Electrician?”, “Do you have the number of a good Plumber?”... inevitably, this approach can involve considerable risk. Why, then, is there not a single company offering consistency of craftsmanship, at a competitive price irrespective of the project or its location? Goodwells Ltd have set the benchmark in one-stop domestic construction projects. Whatever your needs from concept to completion, be it a new central heating system, a replacement roof, or perhaps you are seeking to sympathetically adapt the home you love, we are the company that will listen to your requirements and exceed your expectations. Our clients enjoy a range of benefits, such as our unique ability to source all materials via our group’s in-house builders merchants, passing on the considerable cost savings to you – the fact that we employ a dedicated workforce who only work with us by means of their merits – therefore providing you with an exceptional experience at a competitive price. We are the only construction company to our knowledge that self-imposes serious penalty clauses on missed completion deadlines. We have gone back to basics and reintroduced common values to our industry: integrity, reliability, transparency, courtesy and trust. 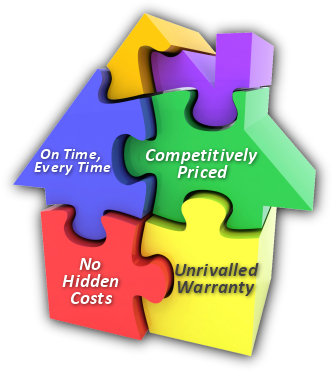 In summary, our aim is to deliver total peace of mind by offering a unique blend of punctuality and high quality service, along with a full range of products at extremely competitive prices, and the confidence of knowing you no longer have to hope for the best. Isn’t life complicated enough as it is?